“What does Second Life say about us, that we trade our consumerist-oriented culture for one that’s even worse?” That's the provocative question online world expert Nick Yee raises in last Sunday's New York Times, a thesis expanded on in an article by Shira Boss. And while it's a good question to pose, it's also the wrong one to ask, at least right now. Because here's the thing: while SL certainly appears to be driven by buying and selling of products, the latest economic numbers simply don't back up the premise of Yee's question. Last month, there were about 600,000 active Residents in-world. According to the Lindens' economic stats, however, only 304,499 of them spent any Linden Dollars. So the rest of the population, 295K, spent none. But look still closer at the figures: of those who did buy goods and services, 131K spent L$500 or less-- about USD$2. Just how consumerist is Second Life when 71% of the active population is spending less than $2 a month, and half of them are buying nothing at all? One could go on, and one might as well: in August, some 79% were spending less than L$2000 (USD$7.50); 85%, less than L$5000 (USD$18.50); and 91%, less than L$10,000 (USD$37). Only when you get to that remaining 9% do you see significant spending in terms of real dollars. The vast, vast majority of the population, however, buys less in Second Life per month than most people in the developed world pay for a single night out on the town. What percent of active SL users qualify as avid consumers? This is a judgment call, but let's say those who spend more than L$10,000 a month-- that is, about 60,000. That is, 10% of the active population. Pointing this out isn't meant as a criticism of Nick, a scholar I like and depend on a lot. Nor even is it meant to detract from Shira Boss. I owe some blame for her misapprehension, because when she interviewed me, I mentioned a study from early this year suggesting that Residents were spending a lot of money in-world, up to $240 a month on average. The trouble was, I probably didn't emphasize the "on average" part enough. For while a small percent are spending voraciously-- in August, about a thousand spent the L$ equivalent of USD$1,871 or more!-- far far more are spending little if anything at all. It is definitely true that a kind of consumerism is an important part of SL. It's just that the concept as we traditionally understand it isn't in much evidence. There's surely a lot of goods and services that exist in-world, and much of it is trading hands. But what seems more plausible is that the bulk of those transactions are conducted in a barter or gift economy between friends and communities and just as often, total strangers, sharing and trading what they own. This almost strikes me as a reversal of consumerism as it's commonly understood, for it undermines the economic motives for doing so. Ironic consumerism, if you will. Even more striking, it seems to be having a not insignificant impact on real world consumerism. In an extensive survey of Residents, 13% reported that because of their Second Life activity, "I don’t go shopping as much." One more data point: Last night, I checked the Popular Items listings of SL Exchange, a popular virtual commerce site. Eight of the top ten most popular items were not clothing or other avatar enhancements; they weren't McMansions or furniture, either. Instead, eight out of ten were content creation tools. The most popular item? A Universal Translator, to help Residents can communicate with each other in 11 languages. You wrote "The vast, vast majority of the population, however, buys less in Second Life per month than most people in the developed world pay for a single night out on the town." I think this is going too far in the other direction. Comparing absolute money is not going to help you figure out if people are consuming a lot. What is needed to compare is *things,* I think. Does the average SL resident buy more clothes per month in SL than they do in RL? Do they buy more bicycles, furniture, boats, land, and personal or professional services? If you only look at the money, you're only going to see the money, not the consumption of items. That said, the article was very amusing. The deeply-desired fancy car they mentioned, I've never heard of. It would be interesting to find out what sorts of SL things people really long for, across the board. Me, I mostly play within my income from my store (not much) and I've longed for new skins, a fancy dress by someone else, land, some scripted furnishings, sculpie trees, and a catapult. Only some of that translates to real-world consumption! I can answer that one right now - in terms of the metric for things, i can say unreservedly that I and everyone I know owns more cars, bikes, clothes and whathaveyou in SL than in RL. The reason is... well if i want a car i know of several places i can go and buy a box of twenty or so of them for less than a cent. One can't compare or meter SL consumption in any way that elegantly maps to RL comnsumption. They're too different. The important thing for real world businesses though - and the one people often miss - is that sl economic turnover is pretty much irrelevant to rl companies. RL brands already sponsor our entertainment (in the form of the advertising that pays for our tv, magazines etc). The money is in RL brand identity for some, and providing that entertainment (or in world services) for others. The real figures for what money changes hands over SL are largely hidden outside the SL economy. Looking at the figures of money changing hands within SL is a red herring. However... there's something to be said for looking at why someone would buy a car for ten US bucks when they can get 20 for less than a cent, or a free one from a RL brand. Those kinds of things don't appear so readily in the stats. Comparing "things" in SL vs RL doesn't work well. 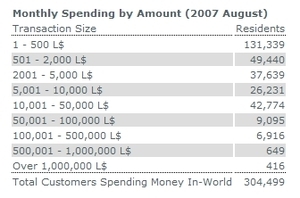 There are no unit costs for anything sold in SL; prims don't cost their creators anything (unlike the earliest days). Uploaded textures do cost $L, but only once. The only resources needed to create to sell are the time, skill and creativity of the creators. Anyone who can use SL has all the resources needed to recreate anything they can buy in-world. Put differently, all goods sold in SL are really services. Put the figures into perspective too: L$500 can go a long way depending on what you're buting. For the thrifty, L$500 is a whole shopping spree for clothes; single items start around $L50, outfits or "fat packs" of similar items can start as low as $L125, give or take. Stuff that costs more than a few hundred L$ is in the category of things one saves up for; for some that takes a while and it's even harder when most newbies don't recieve stipends anymore. "L$500 can go a long way depending on what you're buying." That's true, though the equally interesting point to me is that half the active user base *aren't buying anything*. I'm sure LL tracks those figures, Elle, and in retrospect it's pretty wild they used to publicly publish the top 10 wealthiest *on the site*. Would still love to see those figures with the names stripped off. Do the figures in what was spent also include money (Lindens) paid for rent and land tithes? If so is that money fairly cosidered "consumption" in the same way that buying my 147th pair of boots is considered consumption? "Do the figures in what was spent also include money (Lindens) paid for rent and land tithes?"